Enjoy this classic genre of Indian Cinema like never before with this immersive, thematic experience from the experts at Sigma Gaming. Sharp colours, wonderful music and animated characters are expected in this party full of prize-based surprises such as the ‘Bollywood Dance Streak Bonus’. This slot promises a great flow of wins for players to enjoy, but this comes with the caveat of a reduced range of jackpot prizes. High rollers should bear this in mind, with the largest five-of-a-kind jackpot returning just 250x of the player’s winnings, which is fairly small in comparison to normal industry standards. Conversely, a player return percentage of 95.52% will result in a decent amount of wagers converted into winnings. Bollywood has carved out a niche for itself as a very lucrative entertainment industry and this slot captures that high-level of entertainment with intense, colourful images, symbols and characters including top talent from the industry such as Shah Rukh Khan, Akshay Kumar and Priyanka Chopra. England-based Sigma Gaming is relatively new studio but comes to the table with a great deal of gambling industry experience. The studio has created a collection of online slot machines that boast sharp graphics, vivid colours and distinct environments to immerse the player into each game. Even sound design is chosen carefully to cultivate a cohesive thematic experience. For example, in Bollywood Party, Indian Cinema iscelebrated with dance features and colourful characters that move around the screen to alter the players’ winnings. Players looking for entertaining, well-made games should make Sigma Gaming their first port of call. The overall Bollywood theme is brought to life with an array of bold colours seen in traditional Indian décor. 3D graphics take a back seat here, for well-drawn characters with caricatured features that promote a more lighthearted tone. Similarly the soundtrack is equally lively and true to the source material. While Bollywood attracts big money business and talent, this slot does not share that feature; with a top jackpot of just 250x the line bet value. While this is lower, a low to medium variance will result in more wins for the player. There are just 10-fixed payline, over which, several wagers can be placed from the minimum of 0.10 credits to the high limit of 100.00 coins. In accordance with the top jackpot, a lucky player could walk away with up to 2,500 coins. The Bollywood Dance Streak Bonus is unique in that it doesn’t offer the usual wild or scatter symbols but is activated at random after any spin in which matching symbols appear over 3 reels. Once the wins are calculated, the cast of the film will start dancing beside the reels before switching positions. If the player gets a win, this will unlock a further prize with a chance to re-trigger the feature for a second time. Full-realised features that take full advantage of their source material are still a rarity in the online gaming space. 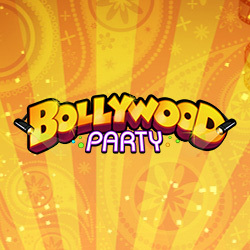 Bollywood Party contains these features and conveys fun and interesting thematic design choices that both promote the unique industry as well as offering entertaining gameplay to players of all skill levels. The lack of a hefty jackpot is a shame but the interactive nature of the bonus features more than make up for it.